1 To develop her students' spelling skills, Mrs. Hardy held mock spelling bees in her classroom. The two best spellers would compete in the school spelling bee with other students from the fourth, fifth, and sixth grades. 2 Spelling was Jasmine's favorite subject, and books were Jasmine's best friends. Books allowed her to dive into the ocean, find buried treasure, or meet stingy Mr. Scrooge. Fairy tales could elevate her into dreams of being a princess. 3 The day came for Mrs. Hardy to disclose her choices for the spelling bee. Jasmine sat on the edge of her seat. 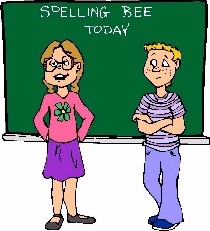 Finally, Mrs. Hardy announced that Reece Bradley and Jasmine Russell would compete in the school spelling bee. 4 Smiling happily, Jasmine looked back at Reece. He surprised her by scowling, as if he were unwilling to take part in the spelling bee. 5 "Way to go, Jazz," Rashad said with a playful punch to her arm. "Do you think you have a chance at winning?" 6 Jasmine nodded. "My Aunt Lucy says anything can be obtained by working hard. I'm going to study the word list till my brains fall out!" 7 During recess Jasmine, Rashad, and Reece met on the basketball court for a game of Horse. 8 "I have an idea!" Jasmine said. "Let's practice for the bee by spelling bigger words!" 9 "Like what?" Rashad asked. 10 Jasmine's dimples showed as she grinned. "Like antidisestablishmentarianism." 11 Reece rolled his eyes and dribbled the basketball. Rashad's jaw dropped. 13 Jasmine repeated the word, trying not to laugh.